Collective decision-making is a familiar feature of our social, political, and economic lives. It ranges from the relatively trivial (e.g. the choice of the next family car) to the globally significant (e.g. whether or not a country should go to war). Yet, whether trivial or globally significant, such decisions involve a number of challenging problems. These problems arise in the standard social choice setting, where individuals differ in their preferences. They also arise in the standard decision-making setting, where individuals share the same preferences, but differ in their decisional capabilities. The distinctive feature of Collective Preference and Choice is that it looks at classical aggregation problems that arise in three closely related areas: social choice theory, voting theory, and group decision-making under uncertainty. 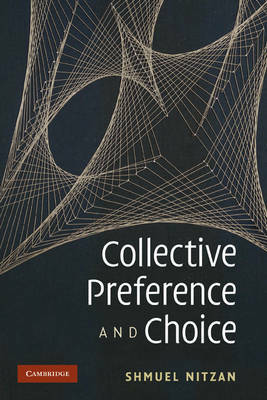 Using a series of exercises and examples, the book explains these problems with reference to a number of important contributions to the study of collective decision-making.